Ruth Meyerson Morhaim, 95, of Champaign died January 21, 2019 at her home. Funeral services will be held at 11 a.m. on Thursday January 24, 2019 at Sinai Temple, 3104 West Windsor Road, Champaign, Illinois 61821 with Rabbi Alan Cook officiating. Ruth was born on August 17, 1923 on the West Side of Chicago, the daughter of Persian Jewish immigrants. 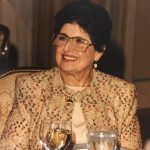 In 1941, she graduated from Marshall High School and went to work in her father’s clothing business, originally known as Meyerson Garment Company later Meyerson Associated Clothing. She married Dr. Isaac Morhaim on November 1, 1953 at Chicago’s Morrison Hotel. When Dr Morhaim went into the Army as a physician, the two were stationed in Portland Maine and in San Antonio Texas with Dr Morhaim rising to the rank of Captain. The couple moved to Champaign in 1957 where Dr Morhaim practiced medicine as a beloved physician until his retirement in 1998. In 1958, they had a son Robert. Ruth was a fixture in the Champaign-Urbana community for more than 60 years and was a loyal and valued member of Sinai Temple, the Champaign Country Club, the Burnham Hospital Women’s Auxiliary, Sinai Temple Sisterhood and many more. She and Isaac were longtime supporters and season ticket holders for University of Illinois football. She is preceded in death by her husband of 56 years, Isaac who died in 2010, her sister Linda Israel and brother Ruben Meyerson. Ruth is survived by a son Robert, daughter in law Cindy, and grandchildren Jack and Nate, along with numerous treasured nieces and nephews from Chicago and Miami Florida. The Family asks that donations be made to Sinai Temple in Champaign, and/or Persian Jewish Congregation in Skokie, Illinois and Temple Jeremiah in Northfield, Illinois. Ruth was a wise, funny and kind person. She brought joy into the lives of everyone she met. She will be missed. Our prayers and thoughts are with her family. Ruth will be remembered in Jacob's heart for taking time to take him out for a sandwich on many occasion when he first came to this country. He didn't know to many people here at that time. Ruth would offer him a ride, a warm meal and hospitality. Very kind, sweet women. To the family, I am sorry for your loss. Ruth and Ike were two of my favourite people in Champaign. They touched many lives. My sympathies to Robert and family. They were very proud of all of you.